Consider Nespresso. They sell in distinctive pods, which provide the right amount of coffee for a cup. Because they’re sold in that unit we compare their price to other places selling by the cup, such as Costa or Caffe Nero. When compared to the £2.50 Costa charge, Nespresso pods, costing 30p-37p, feel like a bargain. But stop for a second and remember back to when they launched. 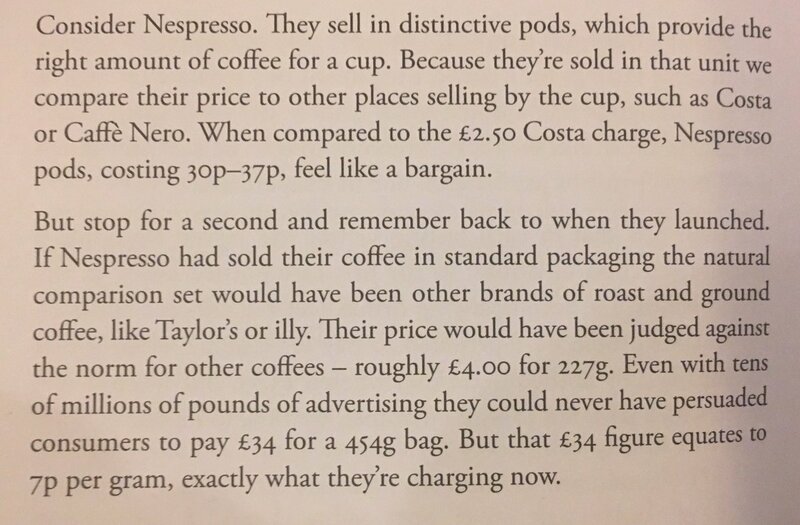 If Nespresso had sold their coffee in standard packaging the natural comparison set would have other brands of roast and ground coffee, like Taylor’s or illy. Their price would have been judged against the norm for other coffees — roughly £4.00 for 227g. Even with tens of millions of pounds of advertising they could never have persuaded consumers to pay £34 for a 454g bag. But that £34 figure equates to 7p per gram, exactly what they’re charging now.